Randomly chosen by the Random Number Generator, congratulations to Lynsey Petree. 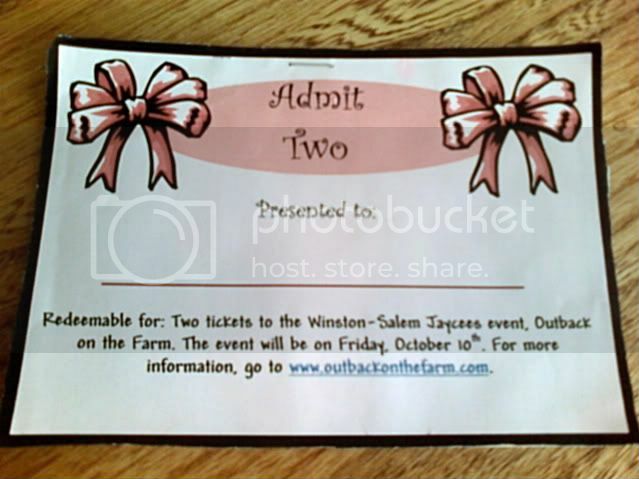 The Outback on the Farm tickets are yours. You've received an email confirmation of your win. And apparently, Friday is your birthday, too. What a nice way to spend it! Thanks to everyone for playing. Just because you didn't win, doesn't mean you shouldn't check out the event. For details, click here. YAY! I WON!!! I can't believe it! Yeah, girl!! Congratulations. I'm jealous you'll be having chicken & steak for dinner. Hey, Friday would have been my grandma's birthday, too, so I'm glad that you got these tickets :) I know you'll appreciate them. Not to say that no one else would have. Um, I don't like not winning - lol. Cogratulations to Lynsey and Brian. I know you'll love the Outback. Congratulations to the winner and Happy Birthday.